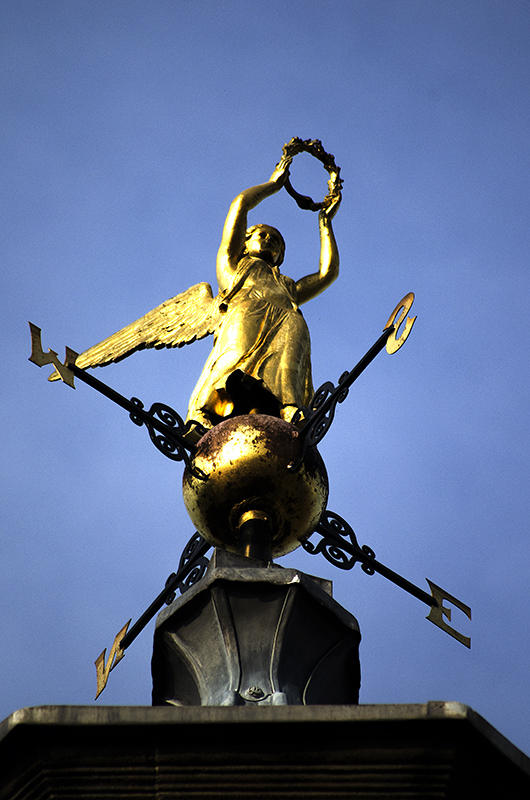 Okay so you know her as the Burslem Angel but did you know that the statue is actually the Greek Goddess Nike? She is holding out a laurel wreath and symbolises civic victory….but what victory? Erected in 1857 I wondered what civic victory there was to celebrate back then…so I turned to Google…and Wikipedia….and there’s not even an explanation of what civic victory is let alone what civic victory the statue of Nike represents. There doesn’t appear to be any pertinent victories in that year either but then the construction of the Town Hall was actually begun in 1854 so…back to Google…and yes, you guessed it, nothing. I also found out that the statue is gilded copper and is lifesize. Lifesize? So they knew the actual size of a Greek goddess eh? Interesting…. Now Greek gods were more reknowned for hanging around on Mount Olympus than throwing a pot or being a saggar maker’s bottom knocker so what was Nike doing in the Mother town? It was designed by G T Robinson, well the Town Hall was anyway which in turn was built on the site of the previous one that had been built in 1761. And that was where the information ended but…I was not to be thwarted! So next I trawled the book shops in Hanley looking for local interest books or local history ones. There’s a fair selection with ones on Stoke-on-Trent in general, right down to one on Blurton. There are ones on Burslem produced by the Burslem History Society and ones with mainly old photographs…which would be good for another time but not for what I required now. Now remember I haven’t got a lot of time to scan/read in these places and I may have missed something but I could still not find out the information I wanted. I found details of how much people paid to be at the opening ceremony of the Town Hall but not what victory the angel was there to commemorate. 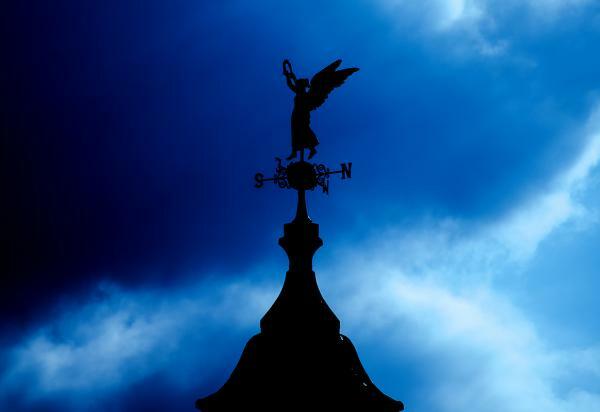 Some books stated that Robbie Williams’ song Angels was actually based on the Burslem Angel but I don’t believe he has actually said as such….has he? And that I am afraid is the juncture I am currently at. I am disappointed that so little is made of the building let alone the gilded copper figure that stands atop it. If we are to encourage visitors to our city surely we should be promoting our heritage….even if we publicized that it was a mystery, that would garner interest surely. I could go on….but I’d better not! And so back to the glorious Burslem Nike angel. I am thinking of going to the library but if anyone has any more information or suggestions on where I might find some please do let me know. I originally looked back on this picture below with the intention of writing a story about it (and I may still do that) but now I’m left with a bit of intrigue, a mystery.